For Ohio State's recruiting efforts, this past weekend was certainly a big one filled with multiple five-star visits, important behind closed doors conversations between the coaching staff and prospects, and most importantly, two commitments to the program. By Sunday evening, the Buckeyes had added to both their 2019 and 2020 recruiting class — with pledges from Marcus Crowley and Jaxon Smith-Njigba — and set themselves up for future success with the impressions they left on numerous big-name visitors. 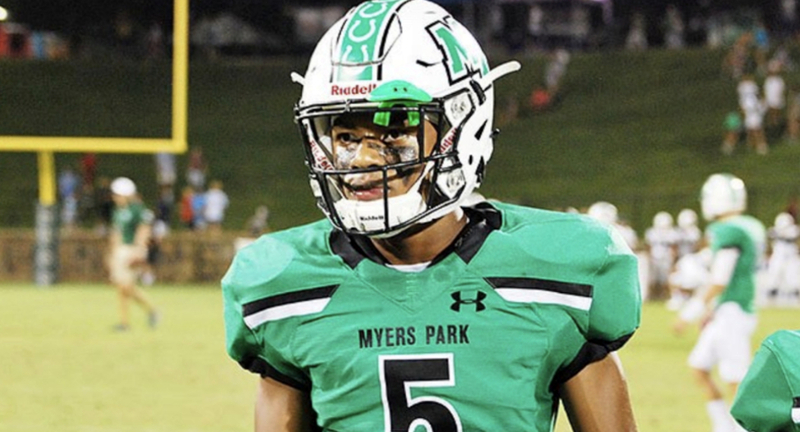 In that group of big-name visitors was a North Carolinian quarterback-wide receiver duo of Drake Maye and Muhsin Muhammad III — both from Myers Park High School in Charlotte. Both seemed to enjoy their time in Columbus. "The game overall was live," Muhammad told Eleven Warriors. "Great fan base! Enjoyed the attention from coach [Urban] Meyer and the rest of the staff." The question that begs an answer is what are the chances both choose Columbus? While that's not as easy to make happen as it sounds, Muhammad and Maye are considering it. "It would be a great experience, obviously, with not only our great chemistry but our close relationship on and off the field," Muhammad said of the possibility. Maye, a sophomore, is listed at 6-foot-3, 180 pounds. He has offers from North Carolina, Tennessee and West Virginia while drawing interest from Notre Dame and Ohio State. Muhammad, a junior, is a four-star prospect that's considered North Carolina's sixth-best overall recruit in his class and the nation's No. 26 wideout. According to 247Sports, he currently has 11 offers on the table, none of which are from Ohio State ... not yet. It would be far from a surprise to see wide receivers coach Brian Hartline go after him. "One of my favorites is coach Hartline," Muhammad said. "Down-to-earth guy and he doesn’t sugarcoat things. I believe he would have the ability to bring out my full potential if [Ohio State] was the future school I would attend." Both Muhammad and Maye have fathers that sustained successful football careers. Maye's dad Mark was a three-year starter at North Carolina, where he passed for 3,459 yards. Muhammad's dad Muhsin played at Michigan State before enjoying a 14-year NFL career. But, as you might imagine, Muhammad III doesn't look to his dad as "just a football player." "I look up to him as more than an NFL player," he said. "He’s my father. He pours street knowledge into me daily, along with his football knowledge as he has played with the best of the best." At some point, you can probably expect to see Muhammad III play with the 'best of the best,' whether it be in Columbus or elsewhere. Either way, the bright lights will find him. "I don't have any other visits locked in for sure but I have a couple in mind," he said. "I'm looking forward to building the strongest part of the relationship, which takes face-to-face [interactions]."